Church of Ireland Gazette, 14th July 1916. This month's Archive of the Month from the Representative Church Body Library (RCBL) commemorates the Battle of the Somme with a focus on how it was reported in the weekly Church of Ireland Gazette. The battle began 100 years ago today with the Allied objective of advancing along the banks of the River Somme to the French village of Thiepval to penetrate the German trench network called the Schwaben Redoubt. Both the 36th Ulster and 16th Irish Divisions were involved at the Somme and paid a heavy price. 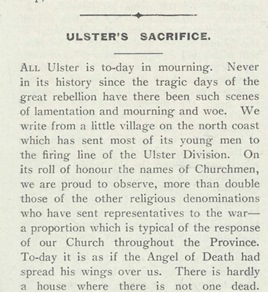 Within a fortnight, the Gazette had published a heart-breaking piece entitled Ulster’s Sacrifice, recording that ‘there is hardly a house where there is not one dead’. The shared experience of unionists and nationalists fighting side by side at the Somme remains one of the most poignant Irish legacies of the First World War, and in the first edition published after the battle began, on 7 July, the Gazette was highlighting this significance. Its lead article of that date – entitled The Somme or the Boyne – was written in the context of government proposals to partition Ireland as a solution to the Irish question in response to the Easter Rising. Speaking for wider Church and island interests as a whole, the article took on the language of appeal that all would remain united in the spirit of the Somme, rather than dividing along green and orange lines, thus promoting the Somme as a symbol of Irish unity. The online search engine, which provides free access to the editions of the newspaper for the entire commemorative period, 1911-1923, reveals no less than 23 different articles covering the Somme between July and December 1916. Thanks to support from the Department of Arts, Heritage and the Gaeltacht, a commemorative reprint of the 7 July 1916 edition – as it appeared for contemporary readers – will be printed and circulated for current Gazette readers on 8th July 2016.